I'm excited! 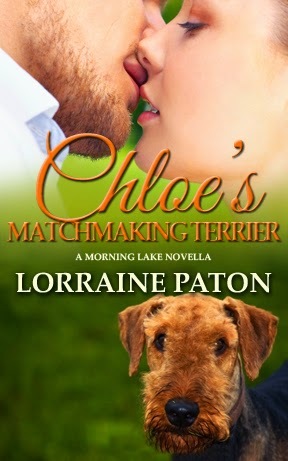 Chloe's Matchmaking Terrier, a prequel novella in my Morning Lake series, will be released in the summer 2014! And today I have the cover to share with you! Isn't the terrier the cutest? Chloe Wagner, after leaving an unhealthy relationship, moves back to Morning Lake feeling lonely, fifty pounds overweight, and ready to start fresh. So when a friend asks her to foster an Airedale Terrier named Ginger, she seizes the opportunity! However, she hadn't realized her dog walk route would take her right by Luke Larsen's acreage. Luke figures he's been in love with Chloe for most of his life. Even though she is only in town for the summer, he can't resist this opportunity to get to know her all over again. Is a summer fling enough to appease his heart? Or can he show her she's perfect ... and they're perfect for one another through every season? Terrier is adorable. It sounds great and will look forward to seeing it. Hi Mae! Aw, thanks! You make me blush! Sounds fabulous and looks great! I didn't realize I'd missed your Christmas book.